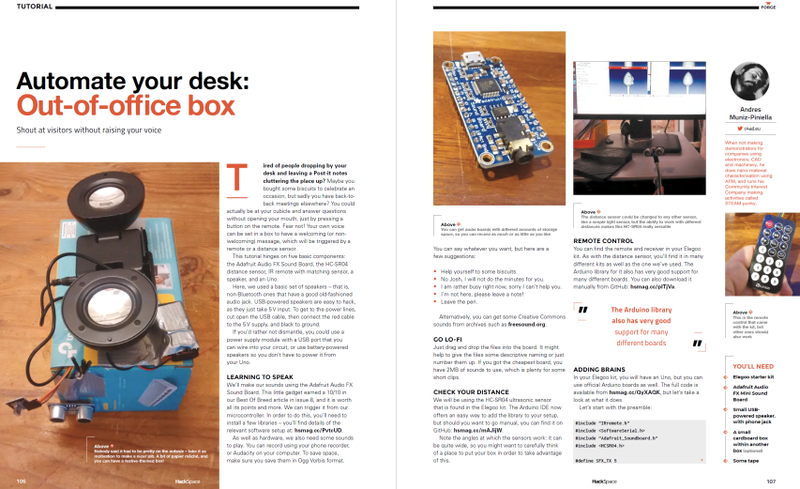 Issue 16 — HackSpace magazine – Automate your desk: Out-of-office box #AudioFX #Adafruit #Arduino « Adafruit Industries – Makers, hackers, artists, designers and engineers! Tired of people dropping by your desk and leaving a Post-it notes cluttering the place up? Maybe you bought some biscuits to celebrate an occasion, but sadly you have back-to back meetings elsewhere? You could actually be at your cubicle and answer questions without opening your mouth, just by pressing a button on the remote. Fear not! Your own voice can be set in a box to have a welcoming (or non-welcoming) message, which will be triggered by a remote or a distance sensor. This tutorial hinges on five basic components: the Adafruit Audio FX Sound Board, the HC-SR04 distance sensor, IR remote with matching sensor, a speaker, and an Uno. Read more, buy issue, subscribe, and PDF.